Blog > Inside Mockplus >Is There an One Lump Sum Payment for the Perpetual License of Any Prototyping Tool? Many prototyping tools provide users with their software perpetual license. Are the perpetual licenses really free for a lifetime? Read this article and see. Various prototyping tools have sprung up in recent years, many of them provide users with the payment model called “Software Perpetual License”. In common sense, “Perpetual License” should refer to“Paying once for lifetime right to use”. However, most prototyping tool companies are currently playing word games on it, redefining “Perpetual License” as “Lifetime right to use the current version”. There is a huge difference between the former and the latter though they seem to be alike. As a result, many users find themselves charged with extra fees when they upgrade their tools. Below I will analyze 4 most prevailing prototyping tools in the current market. Focusing on their payment model, this article can be a reliable “Software Perpetual License” buyer’s guide. The picture above is the hard-to-find Axure buying information that you might have never seen. It is clear that the “Software Perpetual License” of Axure only include Axure 8 and 8.X versions. In other words, Axure 9 will charge you again later even if you paid $495. As a prototyping tool made by a Chinese start-up, I have to say a payment model likes this really has the guts. The health of prototyping tool market has been called for years, nobody stands out. This quiet step of trying actually impels the progress of the shaped prototyping tool market, let alone how much values it brings to users. 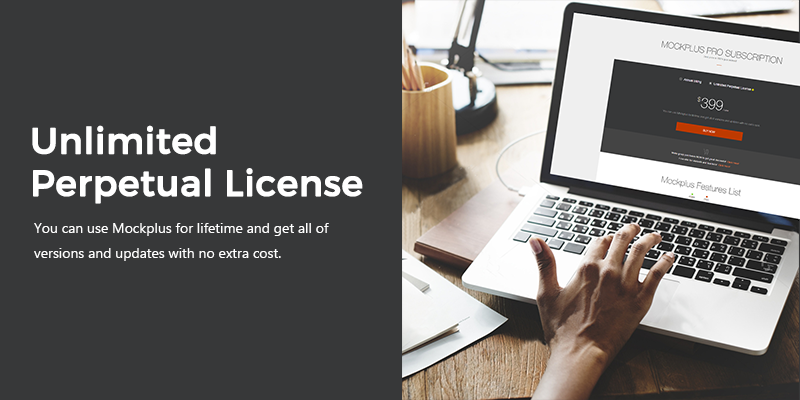 With the ability to make high-fidelity prototypes, Justinmind offers $19/month(paying by the year), $29/month, $495 for “Perpetual License”. Unfortunately, there’s also a “LICENSES FAQS” on the purchasing page, in which Justinmind makes it clear that users who have bought the “Perpetual License” have to pay $671 more every year after the first year. Balsamiq is famous for it’s hand-drawn style prototype, though I don’t want to comment on its style and functions. As far as the payment model is concerned, Balsamiq is cool. It provides users payment model from $89 to $9,790. There are no maintenance costs for the license. If you don’t mind hand-drawn style, it’s okay to choose Balsamiq. The market of prototyping tools is not new but still very potential. The newly-rising prototyping tools are taking the responsibility to break some walls like “Fake Software perpetual license”. Tools like Mockplus and Balsamiq will be the terminator of gray customs.